Read the full 2018-2019 FIA World Endurance Championship Sporting Regulations HERE. According to their race record and achievements, the drivers of the FIA World Endurance Championship (WEC) are categorized by a dedicated committee of the FIA as follows: Bronze, Silver, Gold, Platinum. LMP1: No Bronze drivers admitted. 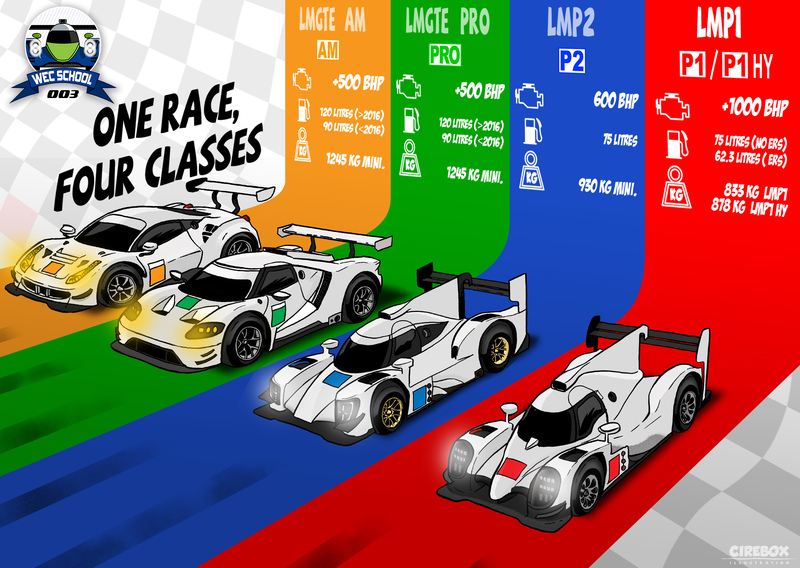 LMGTE Pro: Composition of drivers’ line-ups is free. LMP2: A 2 or 3-driver line-up must include at least 1 Silver or Bronze driver. LMGTE Am: A 2 or 3-driver line-up must include at least 1 Bronze driver and 1 Bronze or Silver driver. - does not generate a sporting advantage in relation to the other crews entered in the same category. LMP2: One of the two mandatory timed laps required for the average time on the starting grid must be completed by a Silver or Bronze driver. LMGTE Am: One of the two mandatory timed laps required for the average time on the starting grid must be completed by a Bronze driver. 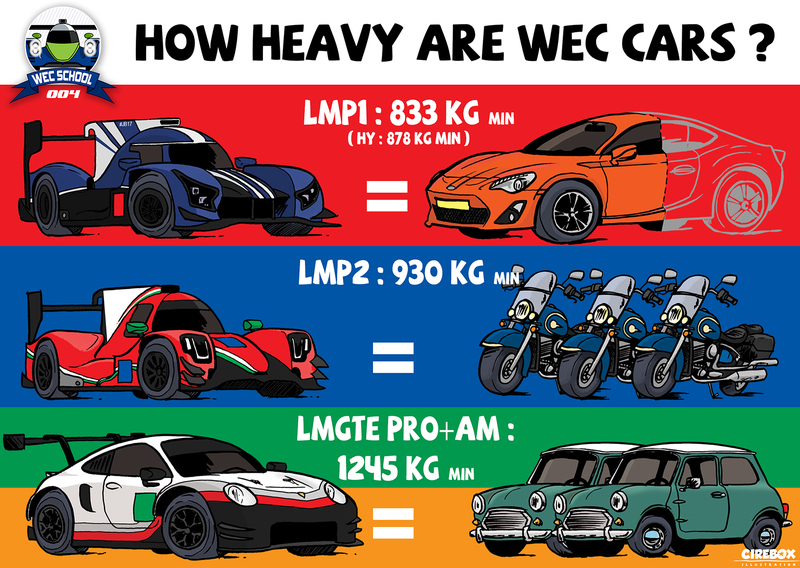 With both hybrid and non-hybrid cars competing together in LMP1, the technical regulators will issue an Equivalence of Technology (EoT) regulation to, as far as possible, equalise the performance of different manufacturers so they can all compete fairly. The first adjustment of performance may be applied at any time by the Endurance Committee. The principles of the Equivalence of Technology (EoT), calculated on the basis of the data collected from the "best in class" of each technology will be applied up to the 2018 Le Mans event inclusive, based on the values specified in Appendix B to the 2018 Technical Regulations. Normally aspirated and turbocharged engines will be split into separate technology classes, along with hybrid powertrains, with the FIA Endurance Committee permitted to adapt the performance on non-hybrid cars only. The main objectives for these cars must be reliability, safety and a low maintenance cost. The FIA and the ACO do not wish to encourage the Manufacturers to invest in LMP2 in any developments which improve the performance of the cars. Thus, should a particular model of car perform too well, under the terms applicable to the adjustment of performance the Endurance Committee may take immediate measures to reduce its performance. The Endurance Committee will favour reducing the performance of the fastest models rather than increasing the performance of the slowest models. The GTE cars are based on production models and are fundamentally different from each other. To create a more level playing field for competition, regulators have the ability to apply fine adjustments in the performance of individual cars to allow each model to be competitive. Adjustments to the balance of performance for cars entered in the LMGTE Pro category during the season are made automatically after certain rounds, according to evaluation criteria defined and agreed by all parties before the start of the season. A calculation tool allows the targets for balancing the different car models to be met, without human interpretation or decision-making, using mathematical formulas based on the quantified, public, specific, measured data obtained during each race. Qualifying is divided into two 20-minute sessions: one for the LMGTEs (Pro & Am) and the other for the LMPs (LMP1 & LMP2). Two drivers from each crew must at least set one timed lap in qualifying. The reference for the starting grid is calculated on the average of the two fastest lap times (one per driver). If at least two crews set an identical average time, priority is given to the one who set it first. Timing screens of the official APP and website display the overall position on the starting grid and the best average time in qualifying, the latter being displayed on the “AV.LAP” column. During one of the official practice sessions, each driver must set a time at least equal to 120% of the average of the best 3 times set by 3 cars of different makes, and 110% of the best time set by the fastest car in its category. During one of the official practice sessions, drivers must set a time at least equal to 110% of the best time set by the fastest car in its category. 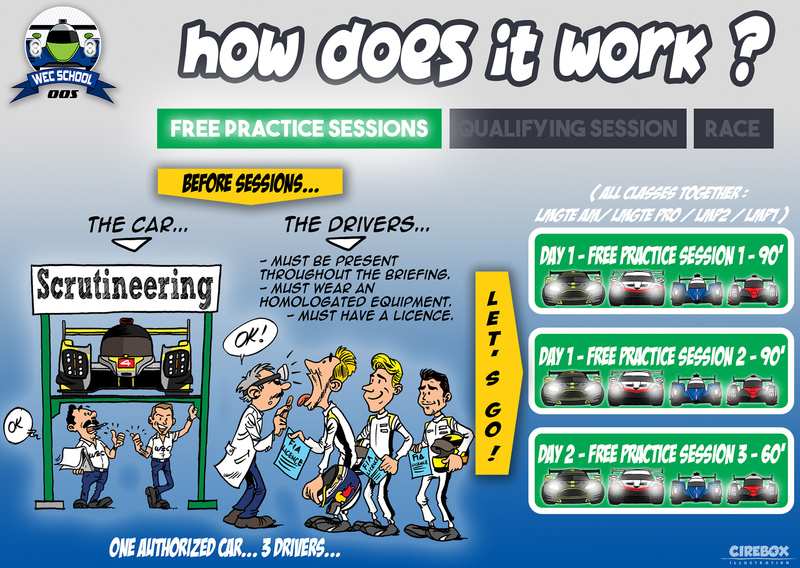 The Qualifying minimum defined above for all categories will be calculated within the session in which the relevant driver took part. Minimum and maximum driving times for 8 and 24-hour races are different and these can be found in the 2018-2019 FIA Sporting Regulations. On the decision of the Race Director, the safety car may be deployed to neutralise a race if competitors or officials are in immediate physical danger but the circumstances are not such as to necessitate stopping the race, to start a race in exceptional conditions (e.g. poor weather), to pace a rolling start and to resume a suspended race. The safety car is designed or adapted for high performance circuit driving and with power adequate to maintain speeds at which the types of cars competing in the event can follow it without compromising their normal function. The safety car must be marked "SAFETY CAR" in letters of appropriate dimensions similar to those of the race numbers, on the rear and sides. It must have at least one clearly visible yellow or orange light on the roof and a green light showing to the rear, each powered by a different electrical circuit. It will be driven by an experienced circuit driver. It will carry an observer capable of recognising all the competing cars, and who is in permanent radio contact with race control. 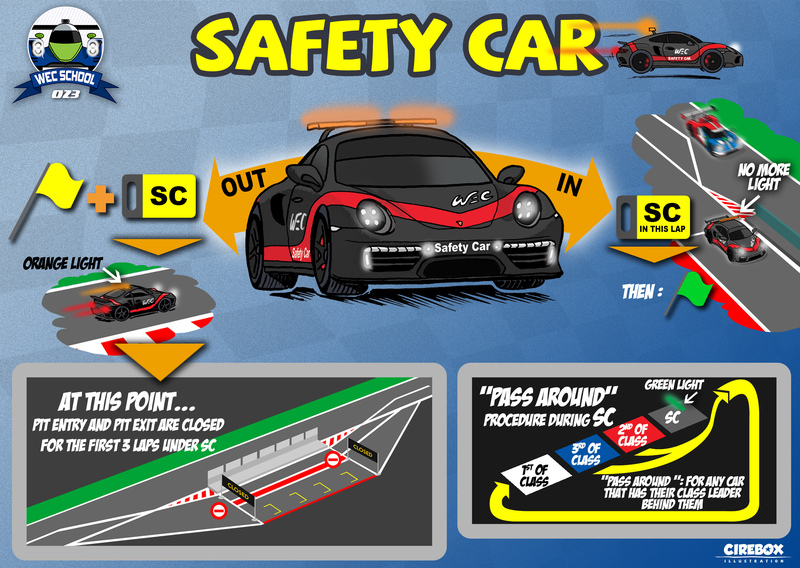 There will be only one safety car in operation at a time, except for circuits of over 7 km in length, where other safety cars, positioned at intermediate points around the circuit, can be authorised by the FIA. When the order is given to deploy the safety car, all marshal posts will display waved yellow flags and "SC" boards and the orange lights at the Line will be illuminated for the duration of the intervention. The safety car will start from the pit lane with its orange lights illuminated and will join the track regardless of where the race leader is. All the competing cars must then form up in line behind the safety car no more than five car lengths apart. When the Race Director calls in the safety car, its orange lights will be extinguished; this will be the signal that it will be entering the pit lane at the end of that lap. At this point, the first car in line behind the safety car may dictate the pace and, if necessary, be more than five car lengths behind it. Each lap completed while the safety car is deployed will be counted as a race lap. The car placed first is the one that covered the greatest distance up to the showing of the chequered flag (the position of the cars on the starting grid is not taken into account). b) Have covered at least 70% of the distance covered by the car classified in first place in the overall classification. c) The official number of laps will be rounded down to the nearest whole number. 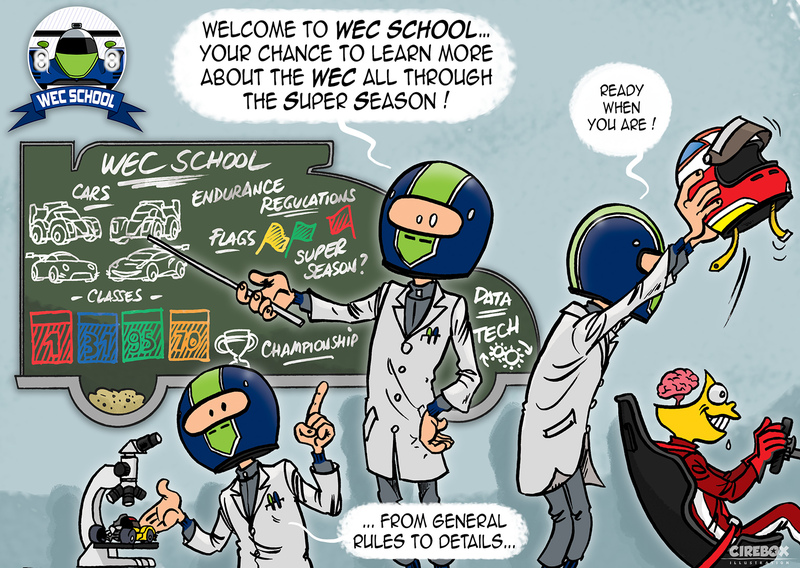 Only full-season entrants can score points for the titles and trophies of the FIA World Endurance Championship. 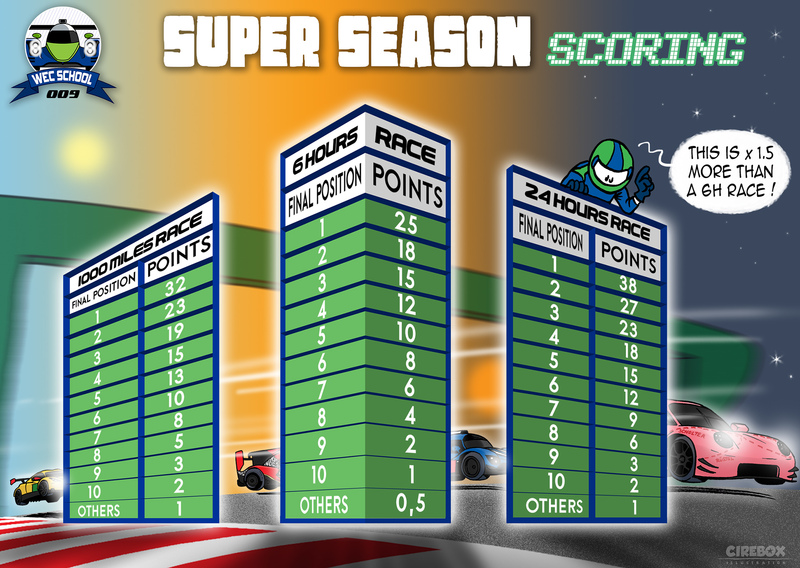 0.5 point: For each car finishing beyond 10th place in the overall classification. 1 point: For each car finishing beyond 10th place in the overall classification of the 1000 Miles of Sebring. 1 point: For each car finishing beyond 10th place in the overall classification of the 24 Hours of Le Mans.